Angular Element is a package which is part of the Angular framework- @angular/elements and it was introduced in Angular 6 and hopefully, this will improve with Angular 7 or higher versions. There are following steps involving to Creating Custom Elements. 1. Install Angular 6 platforms and Angular CLI, if not installed. 2. Create a new project using Angular CLI. 3. Once successfully created your new project, change the directory of your created. 5. 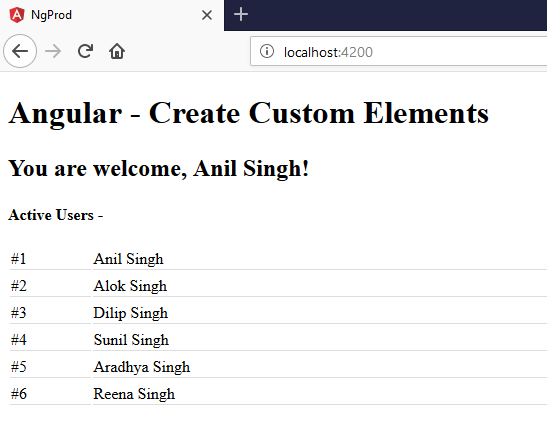 Install web components custom elements. 6. Create your reusable component and it will be used as an Angular Element. 7. Register your comments which are required like reusable components, Injector, and createCustomElement. 8. Use the created custom element in your app. Steps 1 - Install Angular 6, if not install. In the above command, the “ngprod” is the name of my project which I used to create this demo. Steps 3 - Once successfully created your new project, change the directory of your created project just like - ngprod. Steps 4 - Now install Angular elements using the below CLI command. This will work for older browsers and also we will need to open and add below two lines in your project file - polyfills.ts. Steps 6 - Create your reusable component and it will be used as an Angular Element. In this example, I have created a custom element for displays the list of active users (active-user.component.ts and active-user.component.html) and my created component contains the list of activeUsers, applications access user name, and title. Steps 7 - Register the active-user.component in the app.module.ts. And comment the line - bootstrap ( //bootstrap: [AppComponent]) from the NgModule class. And also added the line - entryComponents (entryComponents: [ActiveUserComponent]) in the NgModule. See in the below code. Steps 8 - Register the Injector and createCustomElement in the app.module.ts. After register the required modules in the app.module.ts, we will need to create custom element in the AppModule. //An instance of the element is created or upgraded. //The customElements is used for defining a custom element globaly. Steps 9 - Use the created custom element in your app. Note - I am using created custom element in the - index.html page. An Angular Custom element gives you a new tool for defining new HTML tags in the browsers and creating reusable components.